Our core objective is to have a great time racing and sharing our love for these cars. To do that, we need to race hard, with respect and care for each other and with completely legal, safe, period correct cars that look great. The are two areas the series and the host clubs take extremely seriously. Safety, and Legality. Safety in the form of cars that have been carefully maintained, inspected regularly (including crack tests) have up to date safety and fire systems, and do not leak fluids. Safety also in the form of cars with brake and suspension settings that keep them stable and easy to drive. Legality in terms of engines that make no more than the 114-117 horsepower that a legal Kent motor makes. So please review all the rules and if in doubt at all , contact the series. 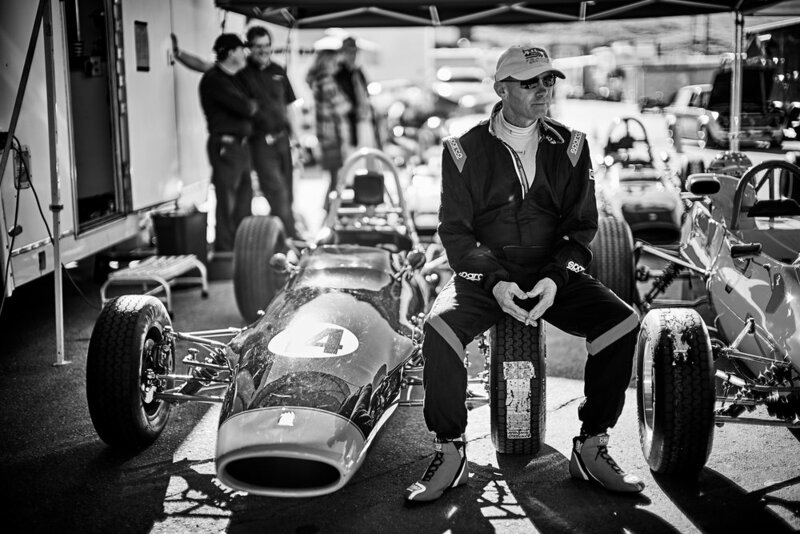 Monopost Rules - We are running the 2018 Monoposto Racing Historic Ford and Club Ford Rules. You can see them at www.monoposto.com. Why? These are the worldwide rules for Historic Competition that the FIA, our sister clubs all over the US, UK, AU, CA, NZ and local clubs like CSRG, SVRA, HMSA, RMVR. VARA, HRG, SVRA, The Royale Series, SOVREN, and more are all adapting to. Crossflow Cup specific variations - We are making a few allowances to be more inclusive rather than less. First, a minimum car weight of 1100 pounds with driver for Historic Fords and 1125 for Club Fords with Driver. At the scales there is a 5 pound variation from the minimum weight to account for accuracy. Also you can use alloy wheels and the Avon A25 is allowed in addition to the A29, the Hoosier VFF and the Dunlop CR81. Scoring - Club Fords and Historic Fords will be scored separately. Race points start at 25 points for a win, down on 1 point for 10th place. All competitors who appear in the first session of the weekend, also generate 2 appearance points. A tie, is solved by successive tie breaker steps, starting with highest average placing, and end with the scorekeepers discretion. Appearance points races are non-Crossflow events that have been designated as points paying events that add 6 appearance points to any qualifying competitor that attends. 1. Each host club's rules are in force for each event. Be sure to review them carefully. 2. Any black flags, contact, illegal cars or unsportsmanlike/unfriendly behavior means you will be excluded from the series. Any exclusion by any VMC club, or host club, means exclusion from the series. 3. Front row drivers will maintain a moderate "pace car" speed until the green flag waves. If the front row jumps to race pace too soon, there will be wave offs and black flags. 4. No splitting back markers, ever. We will talk more about this, but caring for your friends who are developing their skills or happy to race their buddies wherever they happen to be, is a core value of this program and of the Clubs we all support. 8. Remember the race you are in... if you are an HF driver, with a fast CF behind you, move over, this is not your fight. Car Preparation - We are very focused on safe, well prepared card. 1. The host club’s tech will certify the car is competition ready. However, occasionally the series will issue tech and safety bulletins for common key issues or problems. Competitors have one race weekend to comply with the bulletin if needed, with one exception. Aluminum cast hubs are strictly prohibited, unless the competitor can show a certified crack test, no more than 180 days old. 2. All cars will be period correct and presentable. Cars with below standard paint, graphics and other cosmetics, will have one year to remediate if directed to do so by the series or host club. 3. Driver’s names, graphics, period correct advertising is encouraged, but note, may violate local club host rules. The series administrator will do everything possible to waive advertising rules by the host club. 1. You can run Avons, Dunlops if you want them, or Hoosiers. Roger Krause has stepped in to support us, so if you can, run the Avons please. 2. Pit together where possible. 3. One set of tires per weekend max unless you cut a tire. 1. Observable car legality (tires, weights, ferrous brakes and other observable violations) will be managed in the tech and post race parc-ferme (weigh-in). Cars that violate any observable rule will not be scored. Weight violations (+5lbs) will result in post-race disqualification. 2. Engine protests can be triggered by: a. the host club / tech inspector b. the series administrator c. A minimum of 3 competitors lodging a protest with the series administrator or host club tech. 3. The protest will be evaluated and accepted or rejected unanimously, by the series admin, the tech lead for the host club and a neutral (non-protesting) driver (selected by the series admin and/or tech lead). 4. A protest must be lodged within one hour of the conclusion of a race or qualifying session and a $3500 protest "bond" in the form of a check, or cash, must be submitted to the series administrator. 5. The protested competitor must submit the car to impound immediately. Any refusal is considered an admission of guilt, and will cause that competitor to be excused from the event and immediate forfeit of any points or awards up to the point of protest and exclusion from the next 3 consecutive events. 6. If the competitor wants to return to competition after the 3 event exclusion, they must submit to an Enhanced Annual Inspection prior to being allowed to return to competition. As above all points earned up that point will be forfeited and the entire cost of the inspection process will be the responsibility of the competitor. 7. There are two venues for engine inspection and the series administrator has total discretion as to how to approach the problem. 8. If the car is found to be illegal, the competitor will be suspended for 3 race weekends, will forfeit all their points and awards earned up to the point of the protest and will bear 100% of the cost of inspection and re-assembly. $3250 of the protest bond will be returned to the protesters, $250 will be retained by the series towards inspection costs. 9. If the car is torn down and found to be legal, $3000 of the protest bond will be awarded to the competitor towards re-assembly, re-installation costs, and $500 will be retained by the series towards inspection costs. 10. If the car is deemed legal via dyno testing, the competitor will receive $250 for lost time, the series will retain $500 towards dyno and inspection expenses, and the balance ($2750) will be returned to the protester(s). 11. Protests of other major components (transmissions, brake systems, etc) that require disassembly and teardown labor will follow the same steps as above except that the bond amounts and refunds will be determined by the administrator.